PUBG Update 27 hit the game's Public Test Servers on Wednesday, beginning Survival Title System Season 3 Preseason. Preseason will last through March 26, at which point the season itself will begin. In Survival Title System Season 3, players will be able to earn Survivor Points more easily, allowing them to rank up more quickly. Survivor Points from Season 2 will only be soft reset, meaning ​PUBG players won't have to start from scratch in the new season. Every promotion a player earns in Survival Title System Season 3 will grant them a yellow coupon to unlock an item in the coupon store. These coupons can be used in conjunction with those award by Survivor Pass 3: Wild Card. Players can also view the rewards for each Title on the Season page. 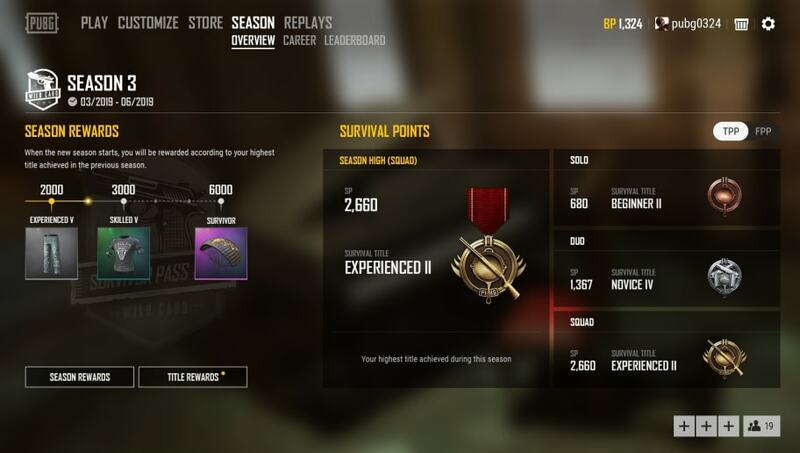 Stats in Survival Title System Season 3 will be recorded and updated at the end of each match, rather than when the player in question leaves or dies. Rewards for Season 2 will be distributed when the Preseason begins to any players who achieved a rank above Novice.